New year, new budget, new car trouble. Have you ever gone to a mechanic for a simple brake job or tire rotation and walked out with a bill well over the budget you anticipated? It is very common as often problems are only real-ized once your vehicle is on a hoist and inspected by a mechanic. Do not fret, you are not the only one and rarely can we predict the repairs our vehicle will need. However, with these fail proof tips, you can be better prepared and ahead of the game. First, lets talk about how you can budget the obvious. I am talking about maintenance. The best way to ensure the least amount of repairs is to be diligent with your maintenance. Car maintenance includes more cost efficient services and need to be done anywhere from 3 to 9 months continuously. Services include oil changes, air filters, tire rotations (or changeover), fluid check and top-ups, brake service and flushes. You can easily budget these into your year, even break it down to monthly, quarterly or semi-annually. Here is an example of effective maintenance budgeting. So here we have a full brake down of what your vehicle will require, guaranteed, each year. If we take the totals for each maintenance schedule, and include the frequency of each, we will see an annual budget of $507 plus taxes. What I did was account for 4 oil changes (basic), 2 tire rotations, 2 changeovers (@$30), 1 fluid top-up @ $75, and 1 brake service per axle. By doing this you can plan out what you will spend each month, each quarter, semi-annual and yearly. Each job can easily be divided like this to give you a clear and precise price. This will help you identify that overall total for all the repairs needed as well as each job so you can plan and budget the work accordingly. Lastly, get saving! Now you know what to expect, roughly, for the entire year. You know you will spend, without a doubt, between maintenance and repairs, $1189.51. While you may run into the odd surprise cost (hit a curb and require an alignment for example), this way of budgeting will have you more prepared. It will also give you the knowledge you need to keep your car road safe and help you plan your time for scheduling appointments. Automotive repairs are rarely cheap, rarely predictable and almost never fit into our al-ready existing budget. By following these 3 steps, you are ensuring less stress, less surprises and most importantly, it won’t leave you deciding between groceries or car repairs. As always, we remind you to Drive Safe, Drive True! It’s a rough go for women when they are dealing with Automotive Repairs. There are so many stories I hear daily of women being taken advantage of in this industry. Some of these horror stories include unfair pricing, unnecessary work being done and sometimes even full out verbal abuse. It is intimidating for a woman to walk into a mechanic shop, there’s no doubt about it. But what if I told it didn’t have to be. What if I told there are some easy, simple and effective tools you can have in your back pocket to ensure you are not taken advantage of. Well, the good news is, there is! The first and most important rule is to NEVER tell the mechanic you know nothing about cars. Even if you don’t! I shudder when I hear these words come from anyone, men or women. You are putting a dollar sign on your head and becoming a target to get taken advantage of. Explaining your car trouble by saying there is a whirring noise coming from the front end is perfectly fine. It is up to the mechanic to diagnose the issue, not you. Give as many details as you can without adding “I have no idea what it is” or “I don’t know what’s wrong, just fix it”. Keep those lines for your girlfriends and never utter them to the shop you take your vehicle to. “Is this what was causing the …. (noise, thumping, stalling, over-heating, etc.)”? “Can I see a break down of the cost”? All automotive shops should be able to back up their quote with a break down of the exact expenses that make up the total for repairs. If something looks fishy, ask about it, and don’t leave without a comprehensive explanation. The third rule of taking you car to a mechanic is never be afraid to request a second opinion. If you receive a quote and your confused as to the repairs they have suggested, or you know one or more the issues had already been dealt with recently, tell the mechanic or advisor you would like to take the car for a second opinion. While this could cost you a bit more by paying for two diagnostics’, it could save you hundreds if the first place was untruthful with their quote. Never feel that you are bound to that one shop or that you are not entitled to a full and comprehensive quote. If they are not providing you with one, then you best get it to another garage. The last tip I offer you is this… If they cannot back up their work or diagnostic with an comprehensive explanation, take your car and get out of there! Whether you are an automotive guru or completely clueless, your quote needs to be backed up with a full and detailed description, if only for your piece of mind. Never be afraid to ask questions, never feel you are not entitled to a full explanation, and never ever walk away feeling you have been taking advantage of. Some people will swear by All Season tires, while others won’t touch them and stick to strictly Winter Tires. Others don’t care either way, as long as their car can get through the snow. Whether your one side of the fence or the other, or somewhere in between, here are some facts about your options for tires this season. All Season tires are great for some of our warmer provinces, however don’t particularly make the cut for Ontario’s winter climate. Because they are made to withstand both warm and cold weather, the integrity in extreme weather conditions is less effective. Many drivers will keep their all seasons on year round. So for Spring and Fall, they are in their ideal environment and work like a charm. However, because of the rubber make up in all seasons, they can get too hot and too cold. When good ol’ Jack Frost greets us with his presence and we see the temperature drop below -10 degrees we find the rubber will harden (freeze) into the consistency similar to a hockey puck. And we all know how great a puck glides on ice. Not too settling is it? Just like how summer tires will harden, when it gets cold enough, all seasons will too. This causes massive risk for collisions, car repairs and additional wear and tear on your vehicle. Winter Tires are built with a much softer rubber meant to sustain the cold. They will keep their traction control much more effectively because the rubber does not harden as easily. 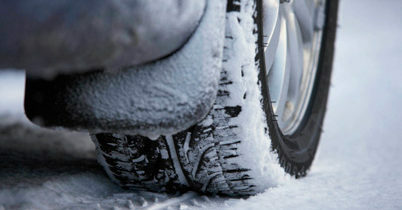 Winter tires can still perform in weather as cold as -25 degrees. Having the appropriate tires on your vehicle will help you avoid very costly repairs. It is also important to remember to have your tire rotated half way through the season. This will also reduce the wear and tear on your tires and provide you with a whole additional year of use, in most circumstances. Awarded Bradford Board of Trade 2013 Entrepreneur of the Year and 2014/15 Business Excellence. Charities include Rose Of Sharon Services for Young Mothers, The Simcoe Police Association, CrossTrainers Canada, BWG Community Initiative & DeafBlind Ontario Services.